I would love to take credit for this, but I cannot. I can tell you that the author is absolutely spot on! 10 Things Every Serious Musician Must Do Daily. Listen and study scores IMSLP.org, Youtube, Spotify, etc all of a composers output, different styles and instrumentation. Chopin, Etudes, Nocturnes, Sonatas and concertos Rachmaninoff’s choral music! It will change your perspective. Go to concerts!!!!! Professional performances, not just piano music. Symphonies, choral music, etc. Record yourself and critique! If you don’t do this, you really don’t have an idea of how we sound…. Ask yourself, Would I willingly listen to this player and if not, why? Scales and arpeggios - in every key? All keys should be equally easy to you. Know the dominant chords in each key, for example, You should improvise and compose all the time. To not be able to do this is the equivalent of having English be your first language and yet not be able to do anything but recite what others have written out word for word. You would not consider yourself fluent! the way to get more fluent in the language of music is to improvise and compose. Ask yourself what are your weaknesses, musically and then attack them everyday. Sight-reading, technical issues, etc. 10.Discuss music with other musicians. Help fuel each others interests and inspire each other!!!! Mastering the basics is what makes great musicians sound so great. Knowing that you have control of intonation, tone, rhythm, and time lets you focus on your phrasing and add a depth of emotion to your playing. Mastering time often gets neglected as musicians work to perfect their other skills. But, having a mastery of time is what allows groups of musicians to work together successfully. It’s one of the most important elements of music if you want to perform successfully. And, if you’re serious about controlling time, you need to have a metronome in your arsenal of musical accessories. The difference between practicing with a metronome and practicing without one is like the difference between driving on the freeway with your eyes open and driving while blindfolded. We all tend to slow down when the music gets really difficult–and we don’t even know we’re doing this! Many musicians think they’re doing just fine playing through their music. They’re completely unaware that they’re speeding up and slowing down as the notes get easier and harder to play. With a metronome in place, you will have a guide to show you where you should be focusing your practice time. Here’s what generally happens: A musician will be playing through something and will hit a section where they can’t keep up with their metronome. This leads to surprise and sometimes causes frustration. Most musicians define getting behind the beat and feeling frustrated as a failure. Actually, it’s a huge practice success! You’ve just successfully defined an area where you can concentrate your efforts and make a real change in your abilities. That’s what you’re supposed to do in the practice room! You have found the Tough Stuff – those few, challenging notes that will eventually make or break your ability to perform well. With this knowledge, you can slow that section down and teach your muscles to play it correctly. And, even at the very slow speeds necessary to train your muscles, you’ll still be using your metronome to guide you through the process. The metronome itself can be the tool that points out where 80% of your focus should be in the practice room. Always look at these discoveries as successes and recognize that whatever you cannot play today – and figuring out a way to learn it – is the secret to creating breakthroughs in your technique and musicianship. As practicing musicians we are expected to do the impossible. While playing through a section of music and concentrating on playing accurately, we are supposed to listen carefully to identify the areas that still need improvement. Unfortunately, it is extremely difficult to play and listen to ourselves at the same time. Trying to critique your sound as you create it distracts you and lowers your ability to play your best in the first place! Instead of evaluating yourself as you play, turn on a recorder and focus solely on your playing as you practice a section. There will be no need to judge or criticize your performance as you create it. You can simply play, in the zone and totally focused. When you record yourself, a tremendous weight is lifted from your shoulders. The recording device acts as your audience, teacher, evaluator, and critic. You are simply the performer. After you finish playing, you can listen back to the recording. It is at that time that you can form an objective opinion of the sound you produced. As you listen to the recording, you’ll hear the actual sound you played, and your assessment of the performance will be more objective and accurate. Make sure you focus on your actual sound – not on how you felt while you were producing that sound! You may have felt great or you may have felt a bit of a struggle. Forget those feelings for the time being. Just listen as if someone else produced the sound and accurately evaluate it. How you felt while you were playing always affects your perception of your sound during the runthrough itself. Your feelings affect your already subjective sense of how you’re doing while playing. Don’t trust your feelings! Audio recording is extremely useful for evaluating your sound. If you want to take recording to the next level, shoot video. It will add a whole other dimension to your self-evaluation. With video you’ll still hear your playing AND you’ll see if you look comfortable, composed, and in control. This is a great way to get a feeling for what audiences see when they watch you perform. The most important part of shooting video is to give you the opportunity to clearly see your physical technique. You can watch for inefficiencies, positioning, breathing, muscle tension, and a whole host of other technical details. Without video you are likely to be completely unaware of habits you’re forming. Video opens up a higher level of self-evaluation. You’ll actually see the details that your lesson teacher has been telling you about! With these recordings, you’ll finally know if your intentions are clear. You’ll hear your actual sound. You’ll see what you really look like when you play. *David Motto is a leading authority on learning and mastering musical instruments. He’s authored ten books, and is a musician with over 30 years of professional performing experience. He devotes his life to helping musicians build their skills and confidence. He offers effective and efficient strategies to learn your instrument and also prepare you to excel on stage. As you prepare to be a college music major, make the most of musical opportunities during high school. Here are some basic pieces of advice to give prospective music majors the best chance for success in college and beyond. An instructor who doesn’t possess at least one of these qualities is almost certainly not a good choice to prepare you for a college music program! Students who attend high schools with strong band, orchestra, choir, musical theater or jazz ensembles enjoy tremendous learning opportunities. Those who do not –– students at high schools without strong music programs, or home-schooled students –– should actively pursue music options at junior colleges, community music schools, private music schools, or religious-affiliated centers. Popular music groups such as rock, contemporary worship or pep bands, while valid and fun, seldom challenge young musicians with regards to traditional ensemble skills such as music reading, blending, tuning and balancing, and following a conductor. Participate and enjoy –– but don’t expect these groups to substitute for literature-based ensembles. Singing is the most basic form of musical expression. All music majors are required to sing extensively. Take advantage of every chance to vocalize: high school, junior college and faith-based choirs all offer opportunities to work on your voice, and more importantly, your ear. Particularly beneficial are those choirs that don’t rely entirely on “ear learning”, but emphasize music reading as well. Like singing, piano playing is required of all college music majors. If you started on piano but switched to a different instrument, pull out your old books and brush up. If you have never played before, start as soon as you can; junior college Beginning Piano classes are a cost-effective alternative to private lessons. Students who don’t start music theory until college often struggle, particularly those musicians whose backgrounds are primarily or exclusively aural (i.e., vocalists, drummers, and guitarists). Any pre-college theory background is helpful. High school Advanced Placement (AP) Music Theory classes are a tremendous opportunity; so are junior college Music Fundamentals courses. Numerous self-study methods, such as those at musictheorypro.com, are also available. Familiarity with computer notation programs is beneficial. The most common are Finale and Sibelius, which are stand-alone notation programs, and Logic, which includes notation as part of a larger platform with MIDI and digital audio. Some companies offer less-expensive starter versions or educational discounts. PC-based music technology is not limited to notation; MIDI, digital audio recording and editing programs are other powerful tools. Familiarity with technology is extremely valuable to anyone aspiring to a career in music. Serious young musicians often do everything to advance themselves except actually listen to music! Even well-trained students often have a poor aural grasp of basic musical styles and concepts, especially those that fall outside their specialty or preference. Attending live music events not only exposes you to a variety of music, it also gets you in the habit of supporting your fellow musicians—just as you hope they will support you. Tom Hynes is an assistant professor of music at Azusa Pacific University (Azusa, CA), where he teaches Commercial Guitar, Music Theory, and Jazz Combos. He also teaches at the Idyllwild Arts Academy and Northwoods Jazz Camps. He received his BM in Studio Guitar Performance from University of Southern California and MA in Music/Composition from California State University—Los Angeles. His instructional Interactive CD/ROM, The Developing Jazz Guitarist is published by acmuzik.com. His book Modern Harmonic and Melodic Practice (Hynesight Music) is in use as a theory text at APU. Professional credits include the Grammy-nominated recording, Kim Richmond Concert Jazz Orchestra Precious Promises. He can be contacted at thynes@apu.edu. The experience of studying music builds character by promoting perseverance, critical thinking, and problem solving skills. Increased self-esteem and a sense of accomplishment improve social interactions. Music students learn self-discipline and time management, which will help them in all areas of life. 1. Music students attend college at a rate twice the national average. 2. Music students perform better on achievement tests in reading and math. 3. College admissions officers cite participations in music as an important factor in making admissions decisions. 4. Music majors are the most likely group of college graduates to be admitted into medical school. 5. Nearly 100% of past winners in the prestigious Siemens Westinghouse Competition in math, science, and technology (for high school students) play one or more musical instruments. 6. Musical training improves how the brain processes the spoken word, a finding that researchers say could lead to improving the reading ability of children with dyslexia. 7. In a 2000 survey, 73% of respondents agree that teens who play an instrument are less likely to have discipline problems. 8. Students who were exposed to music lessons scored a full 100% or higher on tests covering fractions. 9. 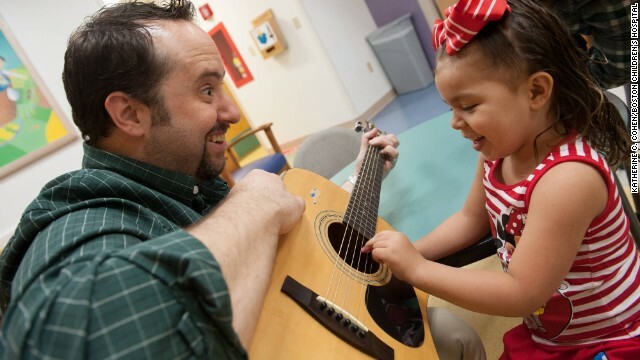 Young children who take music lessons show improved memory over the course of the year. - Dr. Laurel Trainor, Prof. of Psychology, Neuroscience, and Behavior at McMaster University, 2006. 10. The very best engineers and technical designers in Silicon Valley are nearly without exception, practicing musicians. (CNN) -- At 101, Frank Iacono still plays the violin. The concertmaster for the Providence Civic Orchestra of Senior Citizens in Rhode Island, he particularly enjoys playing polkas and jigs. "It keeps my mind active, and it gives me a lot of pleasure," Iacono said. The orchestra's executive director and co-founder, Vito Saritelli, said Iacono is extremely sharp for his age. "Music has played a good part of his longevity," said his wife, Mary Iacono, 94. "We're blessed that we're both in good health." As scientists race to figure out how to promote healthy aging of the brain, and prevent dementia, their preliminary advice for senior citizens has become a chorus of voices: "Stay active! Have hobbies! Be socially engaged!" Playing music, for some people, is a natural answer to all of those recommendations. Frank Iacono, for instance, has been playing violin since he was 13 -- just because he loves it. But does music playing in particular stave off dementia? What about just listening to music? How many years do you need to engage in music before it benefits your brain? Researchers are exploring these questions in the face of staggering statistics about the aging population. The number of Americans 65 and older with Alzheimer's is expected to triple nearly by 2050 -- 13.8 million from 5 million now. The annual cost of dementia in the United States in 2050 will be $1.2 trillion, according to the Alzheimer's Association. Early research suggests playing music may hold back dementia symptoms by about five years -- which would be significant if it proves to be true, said Brenda Hanna-Pladdy, assistant professor of neurology at Emory University, who studies cognitive functioning among musicians. "If you can delay the presentation (of dementia) by five years, then you add an extra five years of functioning to an individual at the end of the life span," she said. "In terms of fiscal cost and everything, that's actually quite a lot." A large study using Sweden's twin registry is looking at intellectually and physically stimulating lifestyle factors that could help stave off cognitive decline. One component of this effort is exploring whether playing music protects against dementia. The results, discussed at the Interdisciplinary Society for Quantitative Research in Music and Medicine meeting in July, are not yet published. Twin studies carry special importance in science. Usually, when people participate in a study, they each carry a different set of genetics and may have had different upbringings. Those factors could influence whatever researchers want to investigate. Fraternal twins, however, share about 50% of genes, and identical twins share almost all. Twins also likely grew up in the same environment. "To me, the most intriguing aspect is, in a twin pair, if one becomes demented and the other doesn't, what did (one not do)? Or what did the one who did become demented do that might give you some clues about ways that other people can mitigate their risk?" asked Margaret Gatz, director of the Study of Dementia in Swedish Twins, and professor at the University of Southern California. Researchers examining the broader twin data have found that, for women specifically, participating in intellectual and cultural activities was linked to lower dementia risk in one study. Activities such as exercise at midlife for both sexes are also protective against dementia, the study suggests. "All of these kind of add up in suggesting that a more engaged lifestyle is a good thing for the aging brain," Gatz said. Why would an "engaged lifestyle" help prevent dementia? The idea is that brain stimulation may counteract brain changes that occur because of cognitive decline so that a person can function for longer, Gatz said. Music playing in particular is something that people can continue to enjoy for longer than their occupations, or strenuous physical activity, Gatz said. It also has cognitive, physical and potentially socially components, so it engages many brain networks. Unfortunately the twin study has so far only looked at associations between lifestyle factors and dementia; it doesn't prove that music can protect you against cognitive decline. The study also doesn't include brain imaging or autopsies, so the precise mechanism -- how engagement in activities would prevent dementia -- is unknown. There is other emerging evidence that playing music could help prevent dementia. Hanna-Pladdy, the Emory neurologist, is interested in exploring the biological underpinnings further. Her theory agrees with Gatz's: Brain networks that have been strengthened by musical engagement compensate to delay the detrimental effects of aging, a process called cognitive reserve. 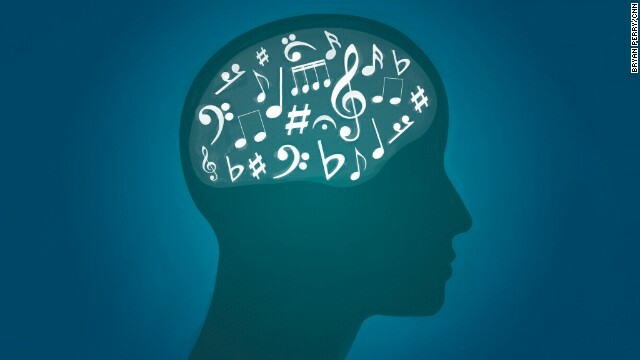 So far her research has demonstrated that extensive musical instrumental training, even in amateur musicians, provides a cognitive benefit that can last throughout a person's life. Her studies were published in 2011 in the journal Neuropsychology and in 2012 in the journal Frontiers in Human Neuroscience; they included instrumentalists, not singers. Hanna-Pladdy and her colleagues found in their first study that even if participants did not continue playing music as they aged, they still performed better at tasks of object-naming, visuospatial memory and rapid mental processing and flexibility than those who didn't play at all -- as long as they had played for at least 10 years. That's critical because as they age, people may lose motor skills or eyesight that prevents them from playing their instruments. The study also suggests the cognitive benefits of instrumental training can last a lifetime. One of the study's participants said in an interview that he felt like having played for so long was akin to "an insurance policy," Hanna-Plady said. The researcher's more recent study showed that musicians who began playing before age 9 had better verbal working memory functions than those who started later or didn't play at all. This finding is consistent with verbal language acquisition -- linguistics studies have shown that there is a critical period during which the brain is open to learning a language, and fluency becomes far more difficult after a certain age in childhood. It also jives with the findings of a 1995 study that showed professional musicians who began training before age 7 had a thicker anterior corpus callosum, part of the pathway that links the right and left hemispheres of the brain. And participants who continued to play their instruments at older ages tended to perform better on tasks of visuospatial judgment, "suggesting that there continues to be plasticity in advanced age," Hanna-Pladdy said. "Finding a way to harness this plasticity is probably one of the biggest hopes we have for treating brain disorders or dealing with cognitive decline in advanced age," she said. "Similarly, continuing to play music in advanced age added a protective benefit to individuals with less education, which has previously been demonstrated (to be) one of the most robust ways to create cognitive reserve. Thus, musical training appears to be a viable model for cognitive stimulation, and can be conceptualized as an alternate form of education." Is it worth it then to teach an older person to play an instrument, perhaps one who already shows signs of cognitive decline? Recent research suggests it's harder, but still possible, to modify the brain in an older person. But no one has a definitive answer on whether teaching an elderly person a new instrument would lead to the same kinds of benefits that scientists have found in lifelong musicians. "It would be pretty challenging, considering they're having a hard time remembering," Hanna-Pladdy said of dementia patients. "It may be beneficial to provide musical stimulation to individuals in the earlier phases (referred to as mild cognitive impairment) or to re-initiate musical practice in individuals who are no longer engaged." Regardless, since people find music enjoyable, trying to learn an instrument won't hurt. But more research is needed over a long period of time to assess fully the benefits of music among elderly people, Hanna-Pladdy said. Evidence may continue to emerge that long-term music playing has a preventive effect against dementia, but that's not to say that nonmusicians are totally out of luck, Hanna-Pladdy said. Music is becoming a hot area of study because it's easier to quantify the number of years that people play music than, for instance, the length of time reading or playing games. "This is just meant to be a model for cognitive stimulation, and how cognitively stimulating activities can change your brain," Hanna-Pladdy said. So music may be good for you, but so may other pastimes. After all, violinist Frank Iacono and his wife, Mary -- married for 66 years -- play Scrabble together every night. For patients who already have dementia, music can be used in a different way to help the mind. The emotional response that people get from listening to music, and the brain chemicals associated with pleasure that get released in the process, are distinct from the structural changes in the brain that playing music over time may instigate, scientists said. 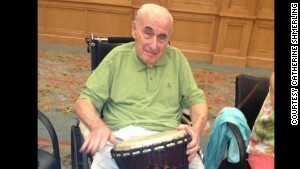 Dr. Sanford A. Shmerling, who has Alzheimer's, joined in drum circle activity recently at his nursing home in Atlanta. Trends emerging from research show that music exposure -- whether through casual listening or more formalized music therapy -- can help reduce the incidences of behavioral issues and generally calm dementia patients, said Beth Kallmyer, vice president for constituent services at the Alzheimer's Association. "Anecdotally what we hear is that people can be upset, even a little agitated, and when they're listening to music, even in the late stages, people can appreciate music," Kallmyer said. Family members should help caregivers choose music that is meaningful to a person with dementia, she said. "The most important thing is keeping your interventions person-centered as much as possible." Naomi Ziv of the Academic College of Tel Aviv Yaffo in Israel and her colleagues showed in a Journal of Music Therapy study that background music is associated with an increase in positive behaviors -- laughing, smiling, talking -- a decrease in negative ones, including aggressiveness and crying. Music attracts attention; it also enhances focus and affects emotion, Ziv told CNN in an e-mail. "When we hear familiar and preferred music, we mentally follow it," she said. "It seems that whereas general memory deteriorates in dementia, memory for music remains relatively intact." Familiar or preferred music evokes memories and influences mood, which is perhaps the underlying reason for these results, Ziv said. Catherine Shmerling appreciates the effect that certain musical events have had on her father, Dr. Sanford A. Shmerling, 85. The elder Shmerling used to be the medical director of the William Breman Jewish Home in Atlanta; now, he lives there. He has Alzheimer's, and most of his speech is not comprehensible, his daughter said. On a recent weekend, a swing band performed at the nursing home. At first the former medical director sat in his wheelchair staring into space, but soon his daughter noticed him clapping his feet. She started swinging his arm with the music, and after a few minutes he gave her "a cute little smile." "It's gratifying," Catherine Shmerling said. "There is something about -- I don't know, the music or the auditory or something -- that does seem to get past whatever it is that's blocking their normal communication, and somehow it gets in there." Science may not have all the answers, but Shmerling savors these small signs that her father is listening. Follow Elizabeth Landau on Twitter and Google+.